A close cousin of the well-known plant mint is “perilla.” It is referred to by some as “Chinese basil” and in many Asian countries adds flavors to dishes and color to backyard gardens. And this herbal cure can take down dreadful hay fever. Perilla grows wild in the Far East so it’s no wonder why it is used in Traditional Chinese Medicine. Specifically, the stem is used to treat morning sickness in pregnant women. But for our purposes, you should know that the leaves are used to help conditions of the lung, including asthma, colds, flu, and allergies. BREAKTHROUGH CURES: Six of your best all-natural allergy-fighters. Even in the Western world, perilla has been studied for its potential ability to halt an allergic reaction, and prevent more reactions from happening. Inside the plant are “rosmarinic acids” that have anti-inflammatory and anti-allergic properties. 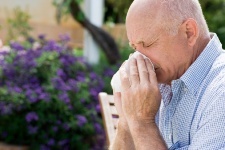 A recent double-blind study tested perilla against hay fever on 30 people. All received extracts of perilla that contained either 50 or 200 milligrams (mg) of rosmarinic acid. Researchers found that both these doses lowered symptoms much greater than placebo. When you use perilla, a typical dose delivers between 50 and 200 mg of rosmarinic acid. Read the fine print on the container to ensure it does contain this acid, because it is the ingredient that works. Perilla also has “luteolin,” another natural chemical that could work against allergies. So you might see this substance listed on the container as well, usually around the 5- to 10-mg range. Researchers have never spotted significant side effects to using perilla. And since it is a stalwart of Chinese cooking, the herbal cure is believed to be very safe. But solely because a quality safety check hasn’t been done, these people should be careful: pregnant/nursing women; patients with liver disease; and patients with kidney disease. Takano, H., et al., “Extract of Perilla frutescens enriched for rosmarinic acid, a polyphenolic phytochemical, inhibits seasonal allergic rhinoconjunctivitis in humans,” Exp Biol Med (Maywood) March 2004; 229(3): 247-54.